Yes, the Spirit logo is mine. It’s more of a “rationalisation” of one of Will’s logos, the one that he came to think of as the definitive Spirit logo. had the least appeal to buyers, and the original comic-book logo from the 1940s (see D above) had the most appeal. Will subsequently lessened or dropped the telescoping (3-D effect) and used the more straight-on logo types seen in E, F and G below. In my version, I’ve rationalised the serifs – some sloped out, some in (the P and the I, for example), redesigned the tail of the R to more resemble the curl on the S, angled the top serifs on the T to again follow the angles in the other serifs, nested the “the” and Will’s signature within the boundaries of the overall logo (so it can be placed on the cover with less wasted space) and made the whole thing less tall, again for a better cover fit. 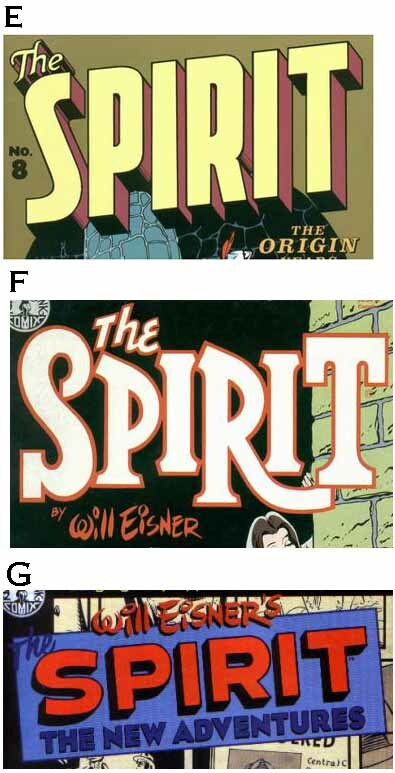 The “Mystery…Adventure” lettering was redrawn using the original as a template, but altering the lower case s to a less script-derived form, then added to the main logo as a roundel into which Darwyn drops a different illustration each issue. I have tried to keep the original flavour, and hope that it’ll be immediately recognisable as the classic logo. These use headshots, in the style of the old Batman logo, and I like them quite a lot, though I think they’d be harder to use on most covers both because of the increased height, and the fact that Rian’s headshots might conflict or clash with the rest of the cover art. Too bad, because they deserve to be seen. At least you can see them here! Thanks, Rian. This entry was posted in Logo Studies on July 18, 2007 by Todd. Nice bit, Todd. Rian really did a great deal of wonderful work on the Spirit project, and it was all sharp. Over 20 executions, if I recall. 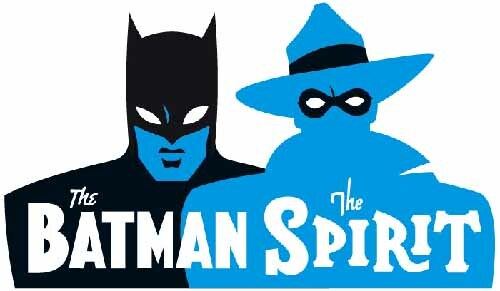 The Batman/Spirits in sillo are particularly smart looking. It’s unfortunate they didn’t work for the cover. They are amazing! Thanks for stopping by, Darwyn, I appreciate your comment, and I know Rian will as well. I may love the little “The” the best. And, I must admit that I’m a bit disappointed to learn that the 3-D covers, reknowned as they are for their graphical excellence, don’t necessarily make the best sales-based logos. I suppose that’s what splash pages are for. I think it was one of those “polish a classic” design jobs rather than a “reinvent the wheel” job. A bit like your beautiful version of the Spirit, Darwyn. I’d like to see the two-heads version on a T-shirt myself. Just sort of browsed my way here, but I wanted to chime in my appreciation for the lettering here. It’s just perfect. Bravo! (the alternates are nice as well) I don’t spend much time thinking about lettering (or coloring until the last few years), but I really appreciate when it’s done well, and I’m beginning to notice missed opportunities when it’s done poorly/blandly.